This thesis describes the design and development of a small, low-cost autonomous mine detection robot that is targeted to check for the safety of the surroundings by detecting the buried landmines and wirelessly transmitting its exact location to the operator which is at a safe distance from the robot. 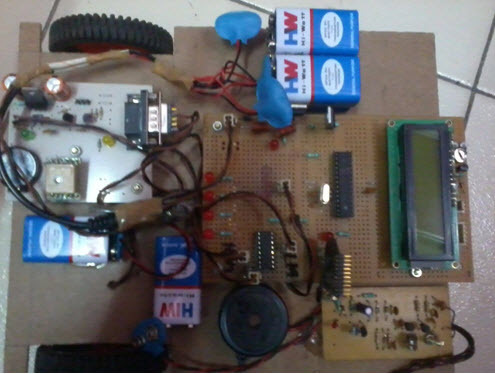 "Human portable unmanned ground vehicle" project is done in fulfillment of Master of Technology in Robotics Engineering and is a very awesome project and need of hour. These are best devices in battle field. You can also Subscribe to FINAL YEAR PROJECT'S by Email for more such projects and seminar. 1. A land mine detection robot is needed to be designed to employ in peace support operations and in the clearance of contaminated areas. 2. The robot shall be able to detect 90% of landmines and wirelessly sending the exact GPS location of the mines within a tolerance of 5cm. 3. For the safety of the operator, the designed robot must be able to operate remotely, moreover, must be equipped with wireless data transmitting capabilities. This project is focused on solving the navigation problems that exist on other low-cost mine detection robots. Several problems had been identified and possible solutions were proposed. The reliability of the robot depends upon the type of sensors or detectors being used. Therefore, the robot platform has been designed to be versatile enough to work with any detectors installed onto it. The thesis also presented the simulation and mathematical modelling of an unmanned ground vehicle which is capable of detecting buried landmines. It is an electro-mechanized vehicle that moves across the field which also serves the purpose of carrying goods from one place to another while enabling the operator to control the robot wirelessly from a distance. It is a basic electric vehicle motor-drive system that is used to investigate power flow during both motoring and regeneration. The simulation assumes a DC permanent magnet motor, perfect motor controller joined with a proportional-integral controller and the electric vehicle battery. The model can be utilized to assess the electric commute's proficiency for particular rate and torque burden conditions. A stable MATLAB / Simulink model was created and validated. It was then used to calculate the system performance and energy flow over a given set of motoring and recovery speed/torque conditions. "Human Portable Unmanned Ground Vehicle" is a very good project for your final year Robotics engineering and also Electronics engineering. This report contains all the material which you needed to build this project. This report also contains source code for LCD programming. Thanks to author of the project for sharing this awesome robotics project with us.